Last week we received the most amazing box of goodies from the lovely Lego Family Blogger Panel, which was simply overflowing with blocky goodness. It’s going to keep us busy for a long time I think. In fact the box was so big I’ve had to bring out a set at a time as there is so much, so the reviews will keep on coming over the next month. 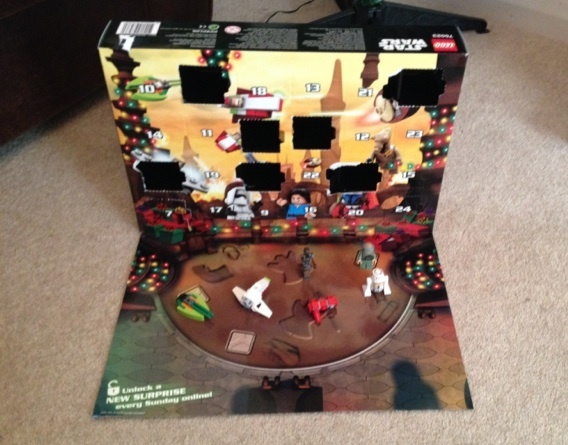 Firstly I wanted to write a quick review of the first item we picked out the box, the Lego Star Wars Advent Calendar. 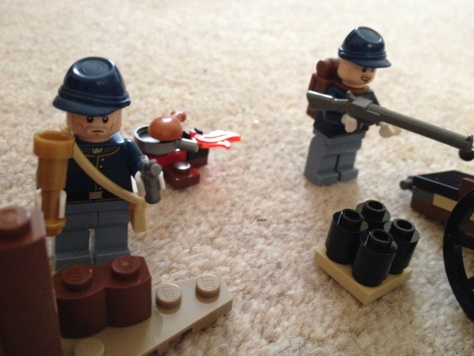 It’s been a real treat for the boys getting a new little Lego model or mini figure every morning. I had to set up a rota of opening to end any arguments. So far we’ve got R5-F7, an Endor Rebel Trooper,and a medical droid I think? Plus lots of little ships. The ones were really waiting for however are the Little Boba Fett and the Santa Jango Fett. Were also excited about getting a Geonosian, as we haven’t got one of those yet. I like the way that the box flaps open, so it’s stable when standing. Plus it acts as a little playmate for displaying all your new Lego models. 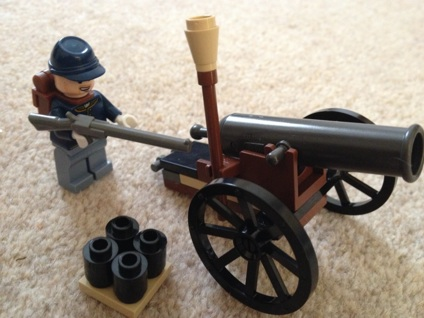 Lego is always going to go down well with the kids, and a new Lego model everyday is even better. A brilliant gift that keeps on giving all month. Plus as it’s already the 9th of December you should be able to find the Lego Star Wars Advent Calendar for a discount now, so it’s an even better deal. 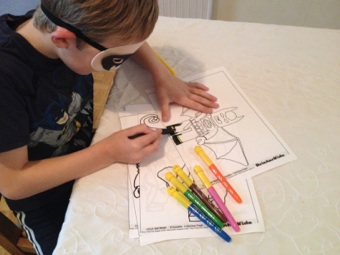 On Friday the Toybuzz house was overrun with Bat Fans, Lego Batman Fans to be exact! 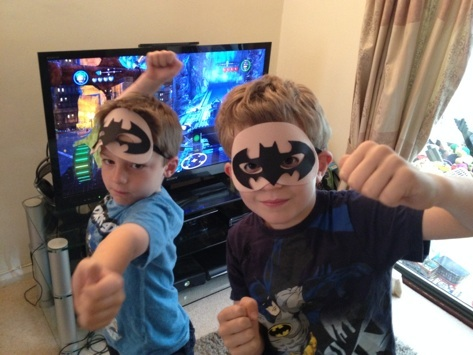 Having received the Lego Batman film on DVD to review, we decided to hold a little screening party with the boys and a few of their school friends. First order of the day after arriving with the over excited group after school was to get them to calm down with a bit of Lego Batman 2 on the Xbox whilst I tried to get tea ready. 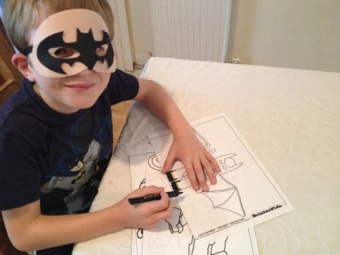 The boys all enjoyed my handiwork with the Batman masks I’d made earlier. 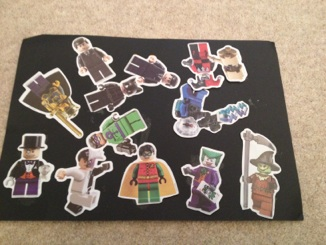 Jacob’s not really a big fan of colouring pages, so he made his own picture using some spare stickers out of a Lego Batman sticker book we had. 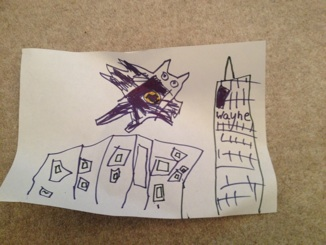 Afterwards he drew a picture of his own of Batman flying over Gotham City. Finally then it was time to settle down and watch the movie – But not before cakes! 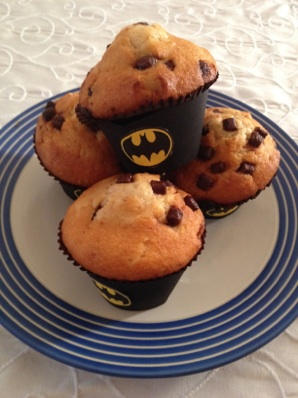 I did plan on making the cakes myself, but time was against me and so I had to buy some store bakery muffins (terrible mother I know) and just make the Batman cupcake wrappers to put them in. Kids obviously were none the wiser and wolfed them down whilst enjoying the film. 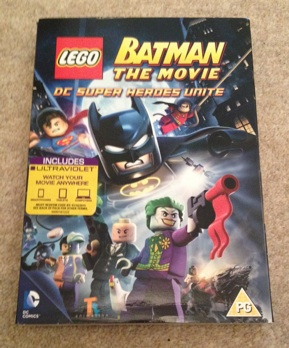 Now down to the important bit, all about Lego Batman the Movie: DC Super Heroes Unite. The movie is all about Joker and Lex Luthor teaming up to take over the world, with Batman and the rest of Justice League out to stop them. If you’ve played the Lego Batman 2 game, then you’ll already know the plot of the movie as it’s featured as the cut scenes throughout the game. You don’t get the full picture with the cut scenes though, and this movie fills in all the gaps for you, and adds loads of extra bits. Even though id sat through the boys playing the game and had seen the cut scenes before, it much more enjoyable and exciting to watch them all together in this way. The boys all enjoyed the movie. When polled they all voted for the part when Batman and Robin go to Jokers lair and he sets up a ton of dynamite which blows to then reveal Jokers face. They all laughed a lot at that. Everyone agreed that the movie was really good fun, and I think that the low price of the dvd makes it an excellent buy to keep the kids happy during the Half Term. Lego Batman the Movie: DC Super Heroes Unite is out now 28th October on DVD and Blu Ray exclusively from Tesco. £5 for DVD, and £7 for Blu-Ray version. 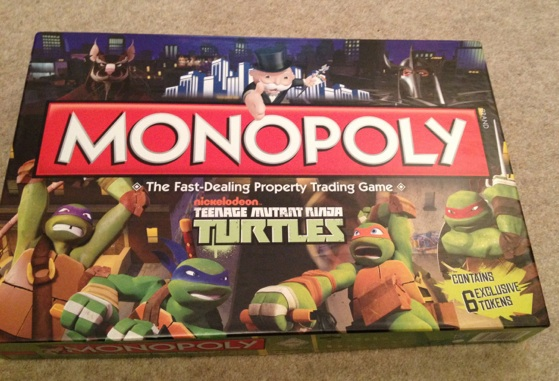 Previously we had brilliant fun with the other Turtles games from Winning Moves we reviewed – Teenage Mutant Ninja Turtles Connect 4 and Top Trumps, so we had high hopes for the TMNT Monopoly. First impressions are really good. 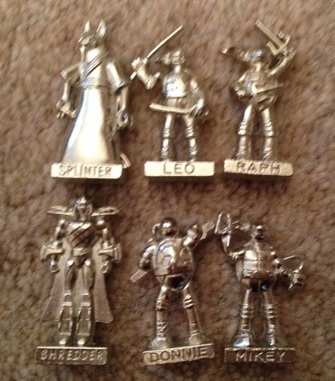 We all were very impressed with the gorgeous games pieces modelled on the four turtles – Mikey, Donnie, Raph, and Leo, Plus Splinter and Shredder. They have a lovely weight, so don’t fall over whilst your playing. The only slight downside we noticed from playing is that the turtles can be hard to distinguish between, and sometimes one of us moved the wrong piece. The best part of getting a new Monopoly version is seeing what the makers have done with the names on the board. If your thinking that being a turtles board game every stop is going to a Pizza shop then your mistaken, One is actually Noodles. No honestly, there’s a great mix of destinations like Shredder’s Hideout, Krang’s Warehouse and Splinters Dojo just to name three. Now I’ll admit were not the biggest Turtles fanboys and don’t confess to know everything about them, but we do watch the cartoons and knew the majority of places named on the board. I think the only couple on the board which we stumped us were Byerly Building, T.C.R.I Building and the Argosy Theatre. Speaking of pizza though don’t fret, every game will have its fair share of pizza time for fans to enjoy. We found it funny that instead of the super tax a few spaces after go, it’s Pizza Tax! Theres also a fair deal of pizza related occurrences in the Turtle Power and Mutagen Cards which replace the usual Community chest and chance. Things like ‘Pizza Bill pay 50′ or ‘Pizza delivery is late receive 100′. The most coveted spaces on the board were where the train stations are usually found. These are now home to the turtles four modes of transport – The Patrol Buggy, The Shellraiser, The Stealth Cycle and a Skateboard. 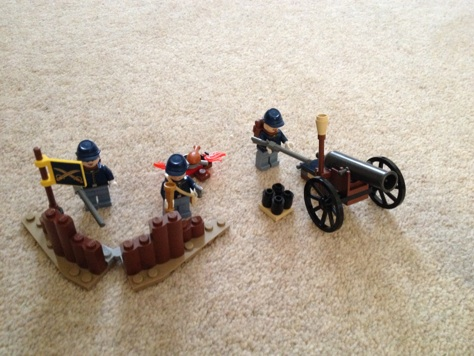 Everyone wanted to own these, but Jacob was the lucky one who managed to negotiate his way to getting the whole set. We had a shell-tastic time playing this turtles themed Monopoly together, so much so that the kids want to play it again tonight! 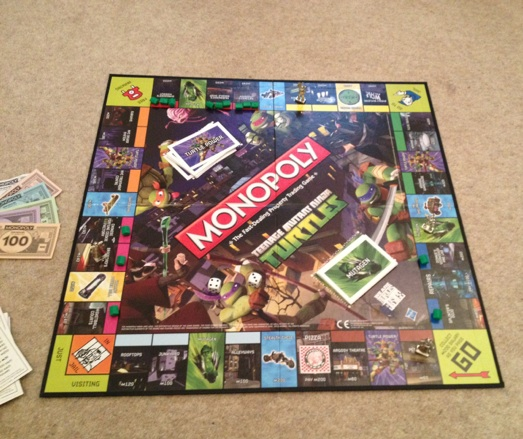 If you’re a TMNT fan or even just a lover of Monopoly varieties you’ll be onto a winner with this game. The wait is over Disney Fans. The game we’ve all been waiting for is finally here. Disney Infinity is released today, and boy does it look good. For those not already aware, Disney Infinity is the brand new video game that allows children to use real toys to create their own virtual worlds. From what we’ve seen so far in trailers and online it’ll be the perfect game for me and my boys. We loved the sandbox aspects of the Toy Story 3 video game, and Disney Infinity is going to be so much bigger and better.Were really looking forward to being able to build our own levels and see what mischief we can create with Jack Sparrow and Sulley. The possibilities are endless. To celebrate the release Disney held the first ever digital character parade, the kind usually found in the Disney Parks. I would have really loved to have been there and watched as an 80 metre high Jessie walked across the buildings, and Buzz flew up the tower blocks, but for those of us who missed it check out the really cool video of it below. 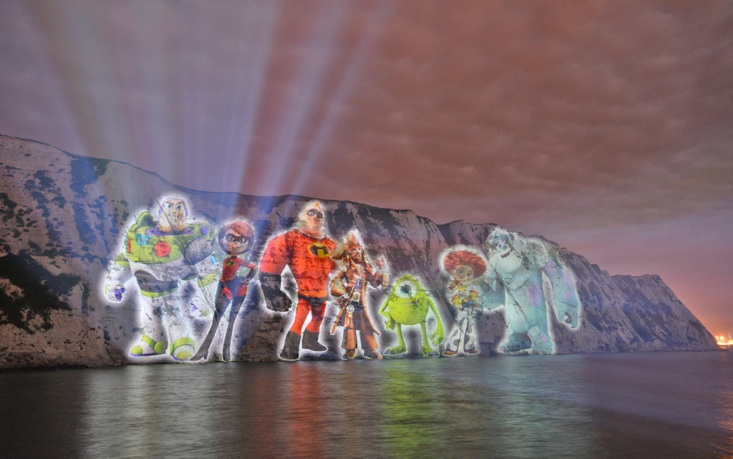 Some of the characters were even projected up onto the White Cliffs of Dover, which is really a sight to behold. The Games Company Winning Moves UK have some great official licensed versions of popular games out now and coming soon. Like Skylanders Monopoly, One Direction Top Trumps and Monopoly Junior Planes. Today is all about the Connect Four. Being Turtle-fied the grid is now green, which I really like. The counters are now not just Blue vs Yellow – but Leonardo vs Shredder. The initial setup did take about 20 minutes as the counters come plain and you need to add the Shredder and Leonardo stickers yourself. This didn’t bother us as we all joined in and had some sticker fun before we even got to Connect Four, but just to let you know that first game will take longer than expected. Aside from the colour and the counters the game is mostly the same game we all know and love, and probably played for hours growing up. 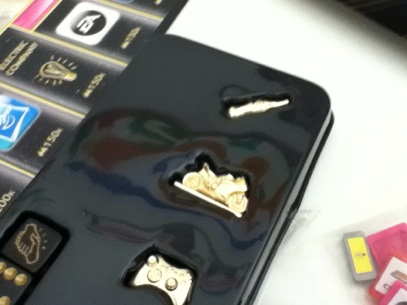 The game has a curved stand rather than the two-pronged legs version I used to play with. This makes the game board much more stable, and also holds the game counter so you can keep track of the score. The one major difference is the addition of the Sewer Lid Blocker used for playing Sewer Style. To play Sewer Style each player gets one Sewer Lid Blocker. You use your blocker by pushing it into one of the holes, therefore obstructing your fellow player from placing their counters in that space. However if your fellow player can manage to continue the game and get the counters to the top of the row then they can then remove the Sewer Lid Blocker, thus setting the counters free to fall and possibly winning the game. Using the Sewer Lid Blockers are totally optional, it’s a nice extra but for younger players you don’t have to bother if you’d rather not. 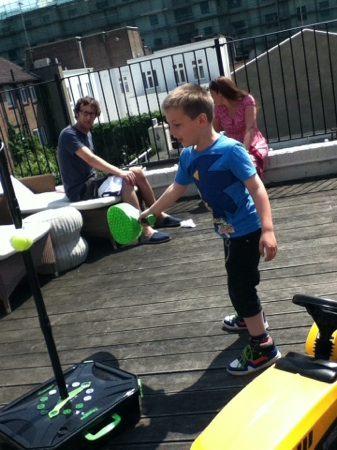 In fact as a family we choose not to play with the blockers every time, it just jazz’s things up when you fancy it. 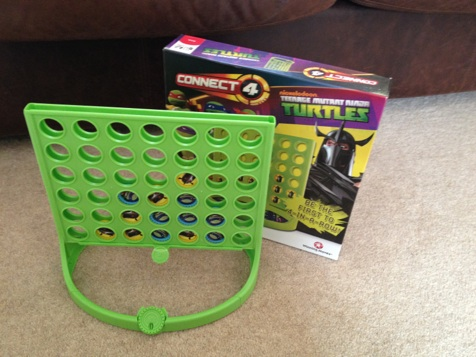 I think that Winning Moves have done a good job at giving Connect Four a Turtles makeover, and to be honest there’s not much more they could have done without messing around with the simplicity of Connect Four too much. 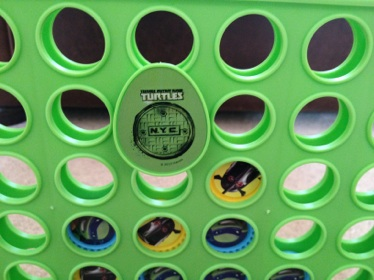 Although I think all children love Connect Four as it is, Teenage Mutant Ninja Turtles fans will get a real kick out of playing as one of their heroes and giving Shredder what for. A fun twist on a classic game, and still great fun! August 9th sees the wait finally end for all of us to get to see the new Disney The Lone Ranger movie. The boys and I are really looking forward to it, as they love Johnny Depp and Pirates of the Caribbean, so were hoping for more of the same but with cowboys replacing pirates. The Cavalry Builder set is the most affordable of the lot, but you honestly wouldn’t know it by looking at all the things you get inside. For £11.99 you get 3 cavalry soldiers, a mini fold up defensive wall, a campfire with pretend flames complete with a chicken cooking in a frying pan, an impressive fireable cannon, and that’s not forgetting our hero the Lone Ranger on top of his horse Silver! An amazing amount of figures and accessories in such a small pack. Thomas and Jacob having been busying playing with the set for around a week now, and are still finding new stories for the Lone Ranger to play through. The only thing the set is missing is a Tonto, but I realise that not every figure is going to be included. Plus it gives us the perfect excuse to indulge in another set. A few years ago Thomas had the Lego Toy Story Woody’s Round Up set for Christmas, and he still absolutely loves that. So in terms of the Lone Ranger sets I think the next addition to our collection will be the Colby City Showdown set. The Sherrifs office in Colby City showdown looks somewhat similar to the Toy Story one we already have, but we’ve always wanted a bank, so I think it will fit into our Lego collection nicely. 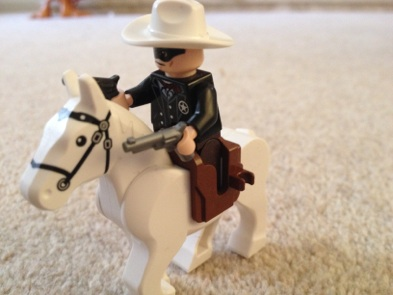 All the family have taken a real shine to The Lone Ranger Lego sets, the Cavalry Builder Set especially so. 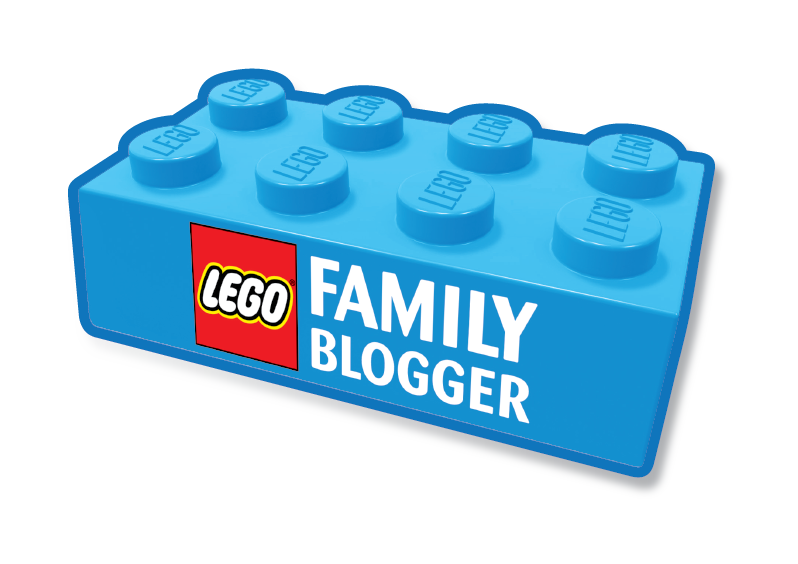 Amazing value for money for the amount of enjoyment you will get out of all that Lego! Following on from my previous Christmas in July adventures yesterday, Last Saturday Thomas, Jacob and I attended the Mi-Christmas Open House near Paddington. We had a simply amazing day and the boys haven’t stopped talking about it yet. We saw lots of great brands and products, so here’s just a snap shot of all the things we saw. The first thing we just had to see and get out-of-the-way was the Annoying Orange Kitchen Crew. Both of the boys are just mad about the Annoying Orange characters, so this just had to be the first stop or I’d never here the end of it. 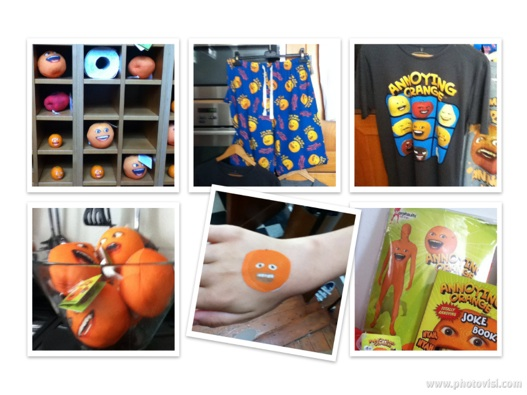 We saw some great T-shirts and Pyjamas, tons of Annoying Orange Plush toys and key rings like the ones we reviewed here earlier this year, Joke Books if you can take Orange’s jokes, and some Annoying Orange Morph Suits which are due to be released later this year. We had a good look around the brand new ranges from Start-Rite, and I just couldn’t help but be drawn to the new collection of Start Rite By Myleene Klass. If you have a little girl there are some beautiful shoes like the Carmen or the Princess Ida. Plus I was so pleased that the boys didn’t get left out, as the Sullivan and the Captain styles are some really smart shoes with serious style. 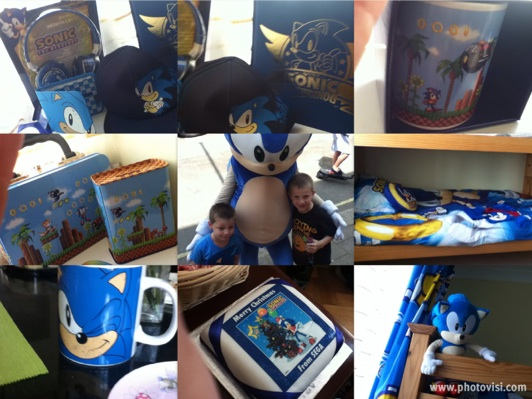 Next we headed upstairs to see a children’s bedroom kitted head to toe in Sonic The Hedgehog goodies. The kids went mad over this room, and made a mental checklist of everything inside for their perfect new bedroom Sonic has always been a family favourite, as I instilled my love of Sonic into them from an early age. Thomas was thrilled to get an exclusive play of the new Wii-U Sonic Game ‘Sonic Lost World’. Coming out this November it’s a mix of 2D and 3D levels. So hopefully something to please both new and old Sonic The Hedgehog fans. As for mummy the huge Sonic mug from Half Moon Bay caught my eye. 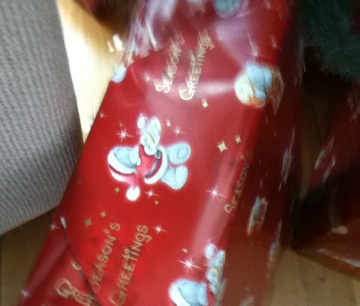 It looks like it could hold about a pint of tea, It was a massively giant mug. We also got to meet with the main man himself, and have some of his yummy christmas cake. Worth the trip just for that! Up another floor of the house and we arrived at the Entertainer Toy Shop Room where they were showing of their pick of the top toys for Christmas 2013. We saw some amazing new Hexbugs that can climb up walls, A new version of the Logo game called Logo Billionaire, and a really quite creepy Monsters University Sulley mask which actually moves his mouth and eyes as you move yours. Our interest was piqued however by the latest version of Monopoly, Monopoly Empire. This one totally won us all over, and It will definitely be a must have for us this christmas. 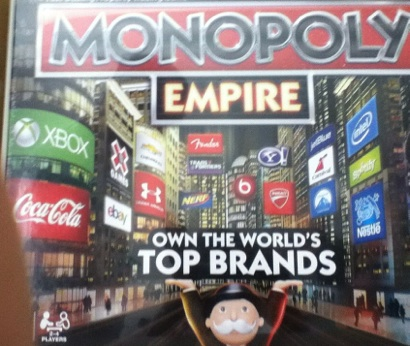 In Monopoly Empire instead of buying streets as you travel around the board, you buy companies. Cool companies I might add, which everyone will want to own. Nerf, Coca Cola, Xbox, McDonalds are just some of the big names. The game pieces have also been updated, including a tiny gold Xbox controller, Coke bottle, Football boot, and packet of McDonalds fries. We are already having arguments over who’s going to have the Xbox Controller piece! Across the hall and we arrived at the JCB Kids Bedroom. This is a little boys dream bedroom if ever I saw one. Even Thomas who’s 8 was bowled over by the bed in the shape of a JCB Digger, and the huge JCB wall mural behind the bed. 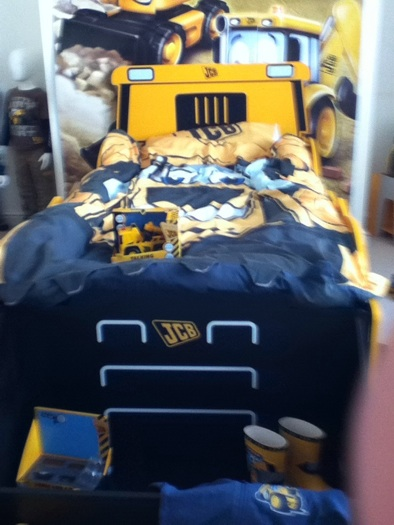 Theres not just a JCB bed either, you can now get the whole bedroom decked out in your favourite diggers. Wardrobes, Tables and Chairs, Toy Boxes and much more are available from Tesco, Asda and Mothercare amongst others. Sadly my two have grown our of their JCB toys now, but I still have happy memories of Thomas on his digger and Jacob in his JCB Coat which he wore everywhere. Another Bedroom, and this time it was decked out head to toe in Tatty Teddy and his Blue Nose Friends. 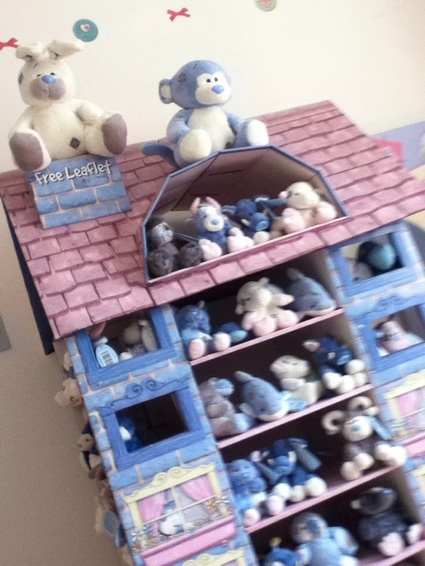 I just love the whole Tatty Teddy and Blue Nose gang, so I was totally in my element in this room. We got to take home a wonderful new Tatty Teddy plush with a brand new ultra soft fur.He is so soft and cuddly it’s adorable, and has instantly gained a place on my bed. As well as the hundreds of Plush friends we saw, I also loved the range of wrapping paper, Gift Bags and Christmas Tree ornaments on display. 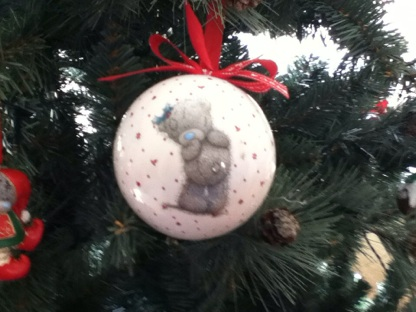 The gift bags were especially beautiful, with a snowy image of Tatty Teddy making a snowman. Some of the snow was highlighted with glitter, and it makes for a truly Christmassy scene. The Tatty Teddy toy playsets were also a big hit with the boys. We had a great time playing with the My Blue Nose Friends Tatty Teddy Heart House, and all the My Blue Nose Friends toy Figures. Our last bedroom, and boy this was a good one for my boys. It was the Nickelodeon room, and it was jam-packed with everything a boy could want. 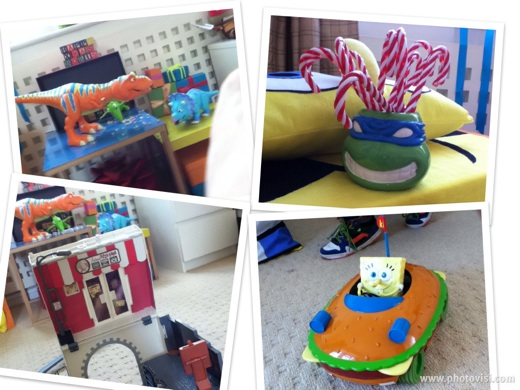 We spent around 30 minutes in this one room alone playing with all the latest Turtles toys like the Turtle Pop Up Pizza Playset, and the SpongeBob Squarepants push along Krabby Patty Car. We also saw some toddler toys in the form of these Interactive Dinosaur Train figures. Each of the animals can talk to each other, and even knows which other Dinosaur Train friends are nearby so they can talk and sing together wirelessly. 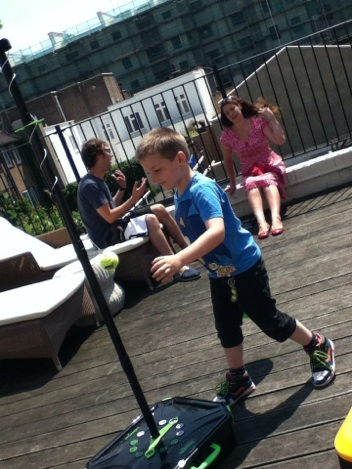 Finally we’d made it all the way to the top of the house, just in time for a spot of Swingball on the roof garden in the most glorious sunshine. We all had a really funtastic day, and thanks to everyone at the Mi-Christmas Open House for having us. 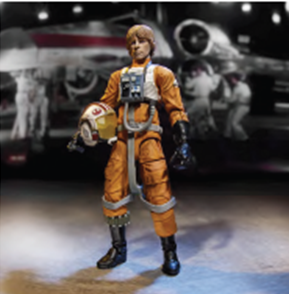 Friday 19th July Hasbro are releasing their latest set of Star Wars figures – Star Wars The Black Series. Aimed at the serious fans and collectors The Black Series promises to have the highest level of articulation and detail available. The series will be launched at a very special Star Wars event at Toys R Us, Brent Cross. Taking place at 7:30pm on the 19th July. 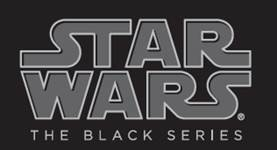 This European launch event allows fans to buy one of just 1138 STAR WARS THE BLACK SERIES 3.75” Figures and 1138 STAR WARS THE BLACK SERIES 6” Figures, which will be exclusively labelled as ‘First Day of Issue’. A limited edition Black Series backing card will also be available at the event, which fans can have signed by the actor JEREMY BULLOCH who played BOBA FETT in the original trilogy! Members from the 501st Garrison will also be in attendance, plus there will be prizes for the best Star Wars costumes. It looks like an event not to be missed for Star Wars fans. So if your nearby and have an excitable young padawan or two I’d definitely go check it out. Doctor Who is Thomas’ new thing, and he’s all in at the moment. With the 50th Anniversary of the series happening this year, every things gone a bit Doctor Who mad, and he’s certainly picked a good time to start obsessing over it. 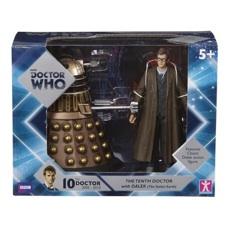 So my ears pricked up this week when I heard about some new sets of Doctor Who Figures from Character Options that Toys ‘R’ Us are exclusively releasing to celebrate the 50 year milestone. All one of the eleven Doctors will be released in a special commemorative set, alongside with one of their most dreaded enemies – The Daleks. 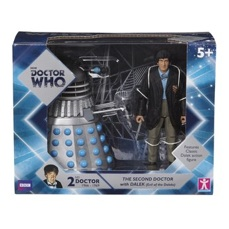 So each set will be a twin pack featuring a Doctor, plus one Dalek that he faced from a famous episode. The sets are being released in batches, with the first 3 available for pre-order now at the Toys R Us Website. 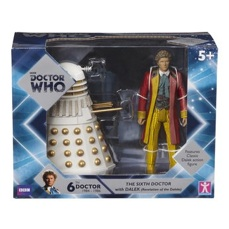 Tenth Doctor and the Bronze Dalek, Second Doctor and the Silver and Blue Dalek, and the Sixth Doctor and the White and Gold Dalek are the first sets collectors and fans can get their hands on. All of the sets will only be available for a limited time, so grab them whilst you can. The first 3 will be retired when the next sets of 3 are released. Each set will retail at £19.99, so not cheap, but not exorbitantly priced. 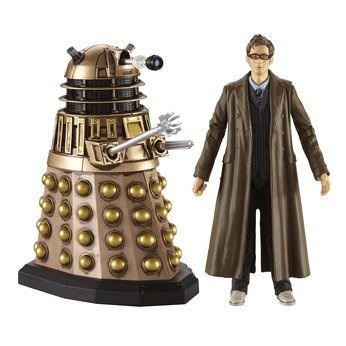 £10 a figure sounds reasonably really for a collector’s item. Thomas is going to have some serious saving to do if he wants the complete set. Which he obviously will! 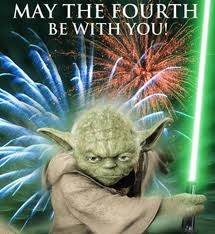 This Saturday is May the 4th, otherwise know as Star Wars Day. All over the world Star Wars fans will be gathering for events, and toy shops seem the perfect place to me for events to be held. I actually thought that more of the big toy shops would have something going on, especially as the day is a Saturday. So this little post is just to promote the stores that are getting in the spirit and celebrating May the Fourth! I am not connected with any of the below events. I just wanted to list a few toy related Star Wars Day events in the UK. If i’ve missed any that are local to you, please contact me and I’ll add them to the list. As well as Star Wars Day, May the 4th also happens to be Free Comic Book Day. Check the website for details of store participation and opening times. The website says that they will have goody bags suitable for all ages, and you might even be lucky enough to bag a Star Wars comic. If you’re looking for Star Wars Days events and you have a Hamleys near you, then I think you’re in luck. Hamleys definitely seem to be putting the most effort in, and have a really strong lineup of events in all of their stores. Princess Leia, some Stormtroopers and possibly a Jedi Knight will be popping over to Hamleys Regent Street. Hamleys Glasgow are pushing the boat out with nearly everyone from Star Wars attending. “Darth Vader, Stormtroopers, Gamorrean Guard Sandtrooper, Imperial Gunner, TIE Pilot, Tusken Raider, Tarfful the Wookie, Jedi Knight and a Biker Scout…. and a very special appearance by R2-D2 on Sunday May 5th! The Hamleys Entertainment Team will also be dressing up and joining in the Galactic Fun! So you might even get to meet Princess Leia and even Yoda. “An amazing weekend this will be”! I love that Hamleys have got so into Star Wars day, and have even made this video.